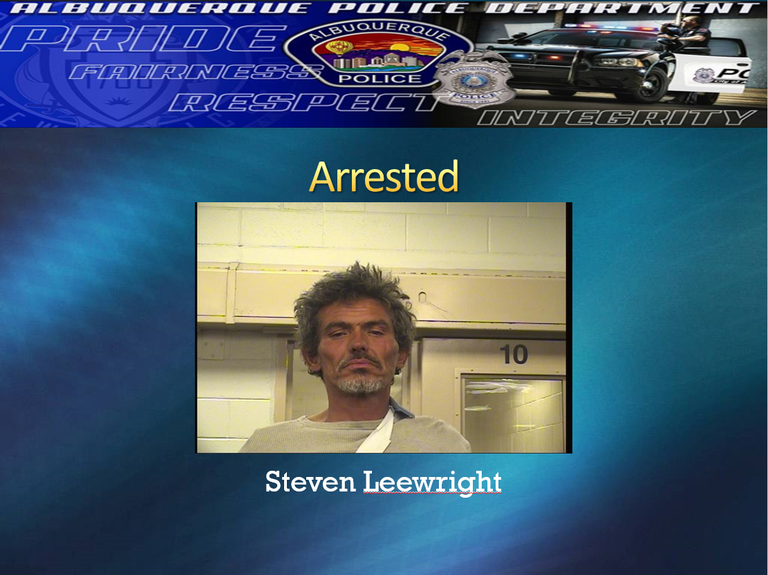 Steven Leewright, 47, was arrested and charged with Aggravated Assault with a Deadly Weapon after threatening citizens with a machete. On 03/29/2017, Albuquerque Police Department Southeast Area Command officers were called to the Smith's Grocery Store located at 6001 Lomas Blvd NE in reference to a male threatening a security guard with a machete. Steven Leewright was identified to be the person who had entered a Dollar Store in the area of the Smith's and verbally threatened to hurt the employee and a female customer inside the store. Leewright was upset because a store employee asked him to leave his bag at the front counter due to a high problem with shoplifting. Leewright refused and was told to leave the store. Leewright at first refused to leave but eventually went outside after his threats and stood outside the store yelling and motioning for the female to come outside. Both the female and the employee said they felt in fear of Leewright and stayed inside the store. A security guard working for the complex approached Leewright and asked him to leave the area due to his behavior. Leewright refused to leave the area. The security guard told Leewright he was going to call police if he did not leave. Leewright then armed himself with a large machete and waived it towards the security guard saying that he was going to cut him as he swung the blade towards the security guard. Leewright then left the area to a nearby gas station on the corner of Lomas and San Pedro. It was reported by the gas station employees that Leewright stole items from the gas station then ran out of the store. Officers arrived on scene and were told that Leewright was running from the area into a nearby neighborhood. Officers quickly established a perimeter and called for additional resources to assist them. Leewright was eventually located hiding in a nearby yard and the machete was located where he was hiding. Leewright was arrested and charged with Aggravated Assault with a Deadly Weapon, other misdemeanor charges and had several outstanding warrants. Leewright has a lengthy criminal history dating back to 1995. He has been arrested over 30 times since 1995 for various charges both felony and misdemeanor. The Albuquerque Police Department Southeast Field Services and K9 Unit did an outstanding job safely apprehending a dangerous subject who was upset because he was told to leave an area due to his own behavior.